In today's society, it is apparent many people do not have the same opinion we have when it comes to the use of alcohol. 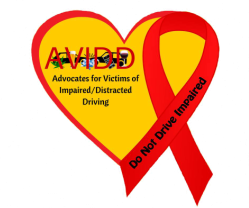 Due to the dramatic tragedies the founders of AVIDD have experienced because of Impaired driving, we at AVIDD believe the abuse of alcohol is a choice. We at AVIDD do not "underwrite" or have any ties with AlcoHawk Breathalyzers; however, we do believe that if we can save one life by suggesting a source for personal breathalyzer we will provide that information. The use of a personal breathalyzer could very well save the life of the individuals using such device or that of someone else. The use of this distributor is solely at the discretion of the individual themselves and in no way reflects on AVIDD in anyway.